From ancient Greece with its mythical legends to the distant future, Kevin Sorbo traveled in his roles all over the millennia and is now on his way to FedCon 28 at the Maritim Hotel Bonn. The son of Norwegian parents became best known for his role as Greek godson and folk hero Hercules in the series of the same name. Science fiction fans also know him as spaceship captain Dylan Hunt from the hit series Andromeda, where he does everything in his power to restore order to the disjointed galaxy. Prior to his TV career, Sorbo spent three years travelling around the world as a teenager, modeling for print ads and was engaged for more than 150 commercials. In addition to acting, he has produced several films, directed, appeared in numerous guest appearances in series such as Xena: Warrior Princess and has worked with many Hollywood personalities. In 2011 he was awarded the “Movie Guide Award” for the most inspiring performance of the year. In the same year his book “True Strength” was published, which tells about the painful recovery from health setbacks that changed his life during his Hercules years. Kevin Sorbo is chairman and press spokesman for the organization “A World Fit For Kids”, which has set itself the task of teaching city children a positive attitude to life with the help of counselors through school, fitness and sport. 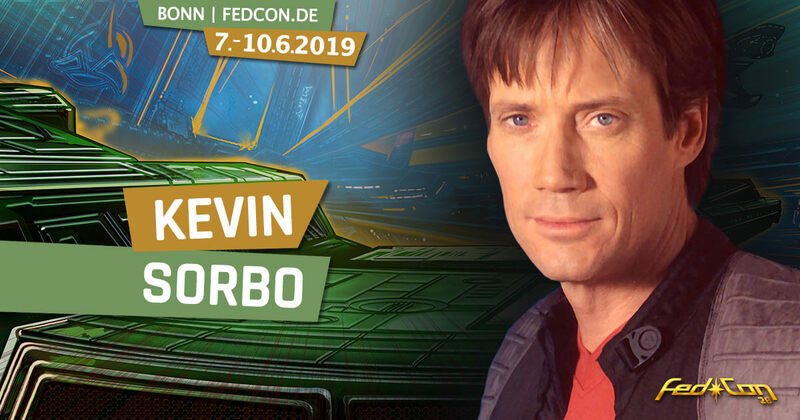 We look forward to many interesting stories with Kevin Sorbo on the stage at FedCon 28. You are not able to join FedCon, you are too busy or on vacation, but although you wanna get an autograph of your beloved actor? For that we invented our Send-in-Service. In our nerd shop - The Space Store - you can either order a standard autograph on a high-gloss photo, or you can send us your item (photo, poster, book, DVD, etc.) and we will have it signed by the star at the event.